A portion of Metro's new Rush+ plan. Rush+ is not a Canadian prog-rock supergroup. It is a new rush-hour service change by Metro that will start on June 18. Well, the transit agency says Rush+ will allow it to serve more customers, reduce crowding and provide new transfer-free travel opportunities. The goal: improving service for 108,000 customers on the Green, Yellow Blue and Orange lines. That sounds great. So do unicorns that can pour milkshakes out of their magical horns. So how will this new Rush+ service actually work and benefit the average rider? Metro put out a news release last month trying to explain how everything will shake down, but that left some scratching their heads. 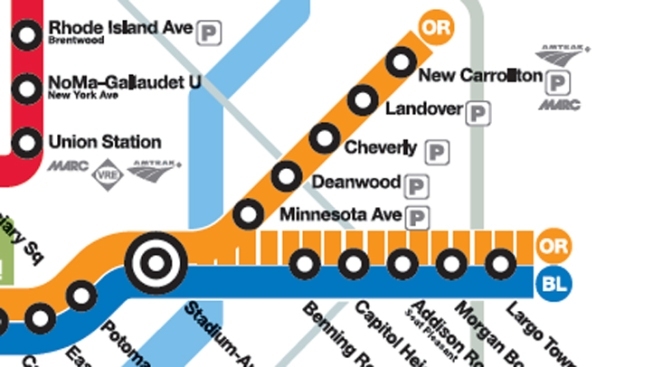 During peak periods, more than 46,000 Orange Line customers will benefit from six additional trains per hour – three in each direction – between Vienna and Largo Town Center. This will result in 18 percent more capacity on the line, or approximately 2,600 seats per hour. For 33,500 Blue and Yellow Line customers in Virginia, Rush+ will increase the share of Yellow Line trains, meaning more direct and faster access to downtown via the Yellow Line bridge. A smaller number (about 16,000) weekday peak-period customers who travel on Blue Line trains via Arlington Cemetery may experience a maximum of six-minutes additional waiting time for a train. Stations of the Green and Yellow lines from L'Enfant Plaza to Greenbelt will benefit from 18 additional trains during rush hour periods (six additional trains each peak hour, three in each direction). And for the first time, customers will be able to travel from Greenbelt to Franconia-Springfield without transferring. More than 28,000 customers will benefit from the change. And if that doesn't help, you could always ask your nearest Metro station employee. Good luck!